Yes, the long awaiting functionality of Windows - burning ISO images support - is here. As I know, the Windows 7 is unable to connect the ISO file as a virtual drive. So you have still to use another software like Virtual Clone Drive. However if you have downloaded some ISO images and would like to burn them without installing any burning software, you can do it. Before we will go to the burning functionality description, I should let you know what the ISO images are. I think many of you are advanced users, but it may be that some beginners could read this article too. So the ISO images are special files containing all the files and folders as a burned CD/DVD. The advantage of using the ISO image is working with just one file. ISO image could contain the boot sector and is ideal for distributing the operating systems. You can burn them using any burning app relatively easily. Don’t forget that you have to use the special ‘Burn ISO image’ function in your burning software. If you will burn the ISO image like another file, you will not be able to see the ISO content. So if you are using the Windows 7 already, try to download some ISO images. 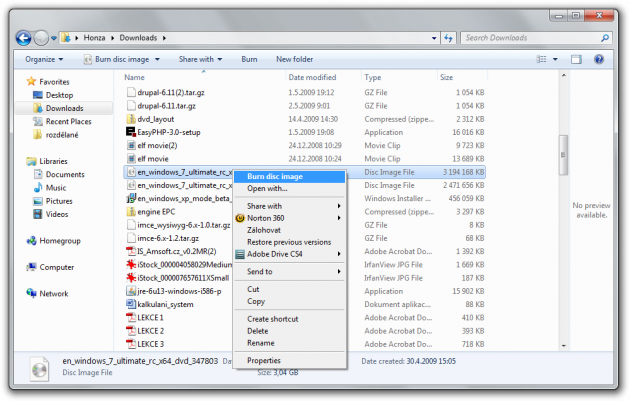 Find it using the Windows 7 file manager and right click this file. 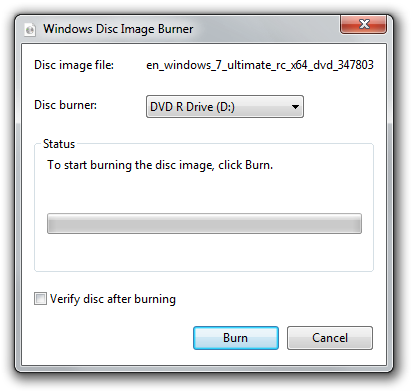 You should see the Burn disc image function. Click on it. The new window will appear. If you have more than one disc burner, select it. Enable the Verify disc after burning feature to be sure the image is burned without any errors. Now insert the blank CD/DVD and click the Burn button. That’s all. Burning the ISO images in Windows 7 is very easy as you can see. However if you are looking for some freeware burning software, check my older article CD and DVD burning freeware – July 2008.